Udupi, August 15, 2018:It was an unbelivable surprise indeed when after 71 years, a handbill printed by the Swatantrya Dinacharane Committee (Independence Day Committee) to celebrate the Independence Day in the temple-town of Udupi on August 15, 1947, reveals with nostalgia programmes chalked out for the historic occasion. A copy of the handbill and a release provided by S.A. Krishnayya, Director of Udupi-based Oriental Archives Research Centre, at a press conference here on August 14, Tuesday, was a source of admiration to lovers of history. The handbill issued in the names of the Joint Secretaries of the Swatantrya Dinacharane Committee, Narahari Kamath and N.V. Kamath, begins by enumerating the events scheduled for August 14 and goes on to August 15, 1947 to celebrate the Independence Day in Udupi. It states that a Yakshagana Tala Maddale, Swatantraya Vijaya, composed by M.V. Hegde would be held in the outer precincts of Sri Madanantheswara Temple on Car Street here from 8 p.m. to midnight on August 14, 1947. It would be presided over by Vittal Kamath, advocate. Soon after the programme, the National Flag would be hoisted by the seer (Lakshmeendra Tirtha Swami of [then] Paryaya Shiroor Mutt) in the same area. The seer would also deliver his address. At the same time, 90 Kadonis (fireworks with loud sound) would be burst, and the bells of all temples and churches will be rung for 10 minutes, along with a five-minute siren and beating of the drums. On August 15, 1947 (Independence Day), at 6 am, a procession (Prabhat Pheri) would leave from Car Street to the Gandhi Maidan through Tenkapete. Manorama Bai Nayak would hoist the National Flag at 7.30 a.m. Ganji (meals) would be served to the participants from 9.30 a.m. to 11.30 a.m. near the Taluk Office. Sweets would be distributed to students in all schools in Udupi from 2 p.m. to 3 p.m. All school students, Congress workers, citizens, government employees and police personnel would gather at Gandhi Maidan from 3 p.m. to 3.45 p.m. They would take out a procession from the maidan at 3.45 p.m., which will pass through Brahmagiri, Kadabettu Road, Government Hospital, Shiribeedu, Badagupete, Car Street, Tenkapete, Koladapete and Court Road. It would then culminate at the Gandhi Maidan. 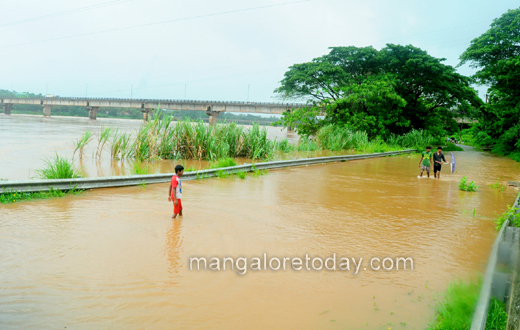 A meeting would be held there at 6 p.m. Balkattabeedu Krishnayya Hegde, president of the Udupi Circle Congress Committee, and Sadanana Pai, Tahsildar, would deliver speeches. It would be presided over by M. Vittal Kamath, advocate. The special instruction at the end of the handbill says that as the country was gaining Independence on August 15, forgetting all differences of caste and creed, the National Flag should be hoisted at all places of worship, public buildings, houses, shops and government offices. All streets should be decorated and there should be illumination with lights during the night, and that people could express their happiness on the occasion. “We request everyone to participate in the above programmes in time and with dedication,” the handbill says. 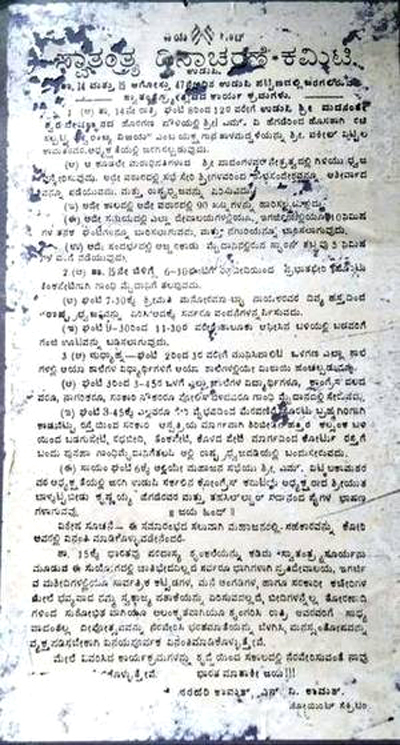 Krishnayya said that this handbill, of rare heritage value, was documented and preserved at the Oriental Archives Research Centre. Ineed it’s a source for a legacy.